256 players online. What was the biggest before that? Resistance 2 with 60? That’s one hell of a step up. We’d have been impressed with a 100. 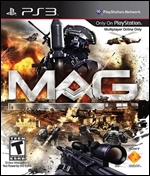 It’s perhaps fitting then that MAG stands for Massive Action Game. So how does it measure up against the likes of Modern Warfare 2 and developer Zipper Interactive’s Socom games? You might want to upgrade your broadband for this one. At the start of the game you choose from one of the three factions. The rough and ready S.V.E.R, the rich Raven and the middle-men of Valor. Annoyingly, you can’t change your faction afterwards, despite the initial screen looking like it has left space for you to create three characters; you have to start again if you want to change sides. A simple patch fix perhaps? There are five loadouts you can create for your soldier with an assault, sniper or LMG weapon available at the start. Each item you carry uses up a set number of points: 1000 for heavy armour, 500 for an assault rifle, out of an allowed 4000 for example. It manages to maintain the balance quite well with a decent level of customisation. As is the standard now, you buy perks as you go along but with Skill Points earned for levelling up. They cost 1-5 points each for extra stability, faster reloads and better weapons and so on. 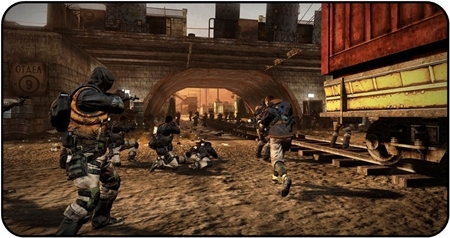 There are several chains of skills, generally gearing you towards one type of soldier, such as a sniper or heavy gunner. You’ll have to choose wisely as the Skill Points are handed out at a stingy rate. After a while though you can reset these skill-points and apply them elsewhere if you want to change your soldier while maintaining the level you’re at. It pales compared to both of the Modern Warfare games though in the number and variety departments, plus there aren’t any of the fun kill milestones to aim for. All the game modes aren’t available from the start, but it doesn’t take long to unlock them all. At first you ‘practice’ with your faction (but still get EXP) in a 64 player team deathmatch. If you’re with Valor (my chosen faction for this review) you get a woodland map to play in, and that’s it. It’s pretty shocking to just be let loose on one arena for team deathmatches. Whatsmore, 64 players is the maximum number for them. 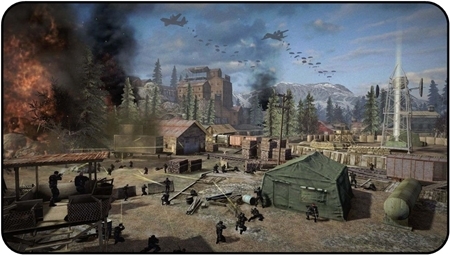 Other modes are objective based with you either defending or attacking targets. If you’re attacking, you may have to destroy two targets before the third is unveiled. In another mode you need to steal /defend two prototype armoured vehicles in a 128 player match. The much-anticipated 256 player matches take place on huge maps with many more targets to be concerned with, with lots of small battles dotted all around. All credit to Zipper, it runs quite smoothly. It’s not perfect though. The lag problems initially seem to be slight. Rarely will you see players teleport around you as the game struggles to load. However, there’s often lag with the bullets. For example, when you’re under fire and you manage to run behind a high wall for cover the last few shots only seem to register when you should be safe. And no, they’re not coming through the walls as a part of the game. On your opponents screen you probably hadn’t reached cover yet. Or it could work the opposite way for you as you unleash a full clip into someone’s back only for them to turn and kill you. Now considering how much teamwork is going to play a big part in MAG’s universe it was surprising that after each map you get dumped back in the menu, with you all separated. Sure you can form groups and meet people on your friends list. But if you’re forming new partnerships, that trust is usually built up over a few consecutive matches with you on the same side, as the same lobby of players go at it. Matchmaking options are non-existent, not even in unranked form. There aren’t even any leaderboards. You can’t choose what map you go to or if you want to attack or defend. Much of this could be blamed on the faction set-up. It’s also disappointing that there’s no solo deathmatch or at least bigger team deathmatches. Oh and there’s no single-player mode at all despite it being a full priced game, at least the similarly online-only Warhawk came with a headset for the same price. 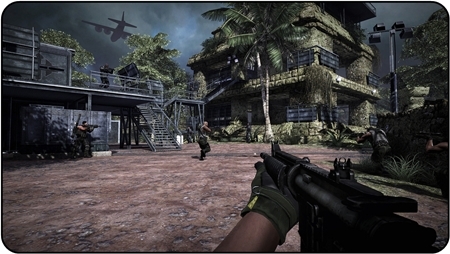 The controls are familiar to most shooter set-ups, but the weapon selection is very slow and awkward. 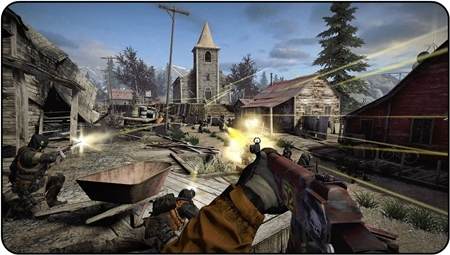 You swap between say a rifle and pistol with R2, while L2 swaps between three secondary items such as health-boost (similar to the one in Bad Company), grenades, repair kit and your rocket launcher. It would have worked better if you could hold down a shoulder button and pick one off a pop-up radial inventory like in Ratchet & Clank. On the plus side you can arrange what order you want them to appear in. The weapons are very weak at times, unless it’s the lag again. But if you hit someone (indicated by a red flash on your reticule) three times in the chest with a sniper rifle they should always go down. The general rule for all MAG’s weapons is aim for the head or don’t bother. The strange thing about MAG is that amongst its failings is one that can’t be fixed by the developers, but only by us, the players. You can play your own game here just trying to notch up more kills than deaths (and fair play to you), but it’ll get pretty old very quick. This is a game that really does shine when you start to work together, otherwise, many of the objective matches turn into stalemates with both sides dozing off into a team deathmatch state-of-mind, or one side taking a base only for the other to take it back a minute later. Imagine that for 30 minutes. If you don’t have a headset you can hear nearby voices on your TV, but you should consider picking up a cheap one to talk back to your teammates to get a co-ordinated strategy going. Once you get to Level 15 you unlock an early command role to ask members of your squad to attack a specific target with the incentive of extra EXP for helping out and you can look forward to calling in air support too later on. It’s good to be able to say that everyone trying to do this has been pretty cool and not calling everyone a f****t if they don’t listen. It’s a proper thrill taking a base with a small group though, just remember not to bunch up so one guy can’t mow down three of you at once if he gets the drop on you. There’s a remarkable amount of unselfish players out there who will go out of their way to heal or resuscitate you on the battlefield which is a way the game performs well at bringing players together. You’ll need to look out for these guys too in return if you know enemies are waiting to nail any passing Samaritans coming to your aid. It’s something completely lacking from the Modern Warfare games. Once MAG gets a steady flow of consistent players that enjoy working as a team whether it be with existing friends or people dropping in, it could become a fun team-based shooter with a keen following. It’s just a shame that the development-time of the game seems to have been geared towards getting it to work with such a large number of players. The downside being a worrying lack of maps, a restrictive faction system, repetitive game modes, and occasionally infuriating lag. Many of these problems could be fixed with a couple of patches and a few free DLC maps though. A work in progress then, for the developers and ourselves.